Note that even though your vehicle may be moderately damaged in a collision, the collision may not have been severe enough to trigger the air bags to inflate. If your vehicle sustains any front-end or side damage, have the air bag system inspected by an authorized MARUTI SUZUKI dealer to ensure it is in proper working order. Your vehicle is equipped with a diagnostic module which records information about the air bag system if the air bags deploy in a crash. The module records information about overall system status, which sensors activated the deployment. Servicing the air bag system If the air bags inflate, have the air bags and related components replaced by an authorized MARUTI SUZUKI dealer as soon as possible. If your vehicle ever gets in deep water and the driver’s floor is submerged, the air bag controller could be damaged. 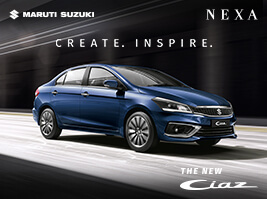 If it does, have the air bag system inspected by the MARUTI SUZUKI dealer as soon as possible. Special procedures are required for servicing or replacing an air bag. For that reason, only an authorized MARUTI SUZUKI dealer should be allowed to service or replace your air bags. Please remind anyone who services your MARUTI SUZUKI that it has air bags. Service on or around air bag components or wiring must be performed only by an authorized MARUTI SUZUKI dealer. Improper service could result in unintended air bag deployment or could render the air bag inoperative. Either of these two conditions may result in severe injury. 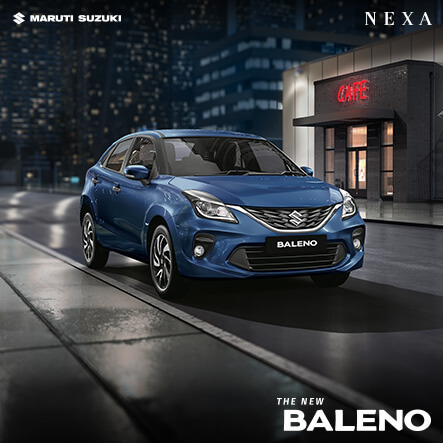 To prevent damage or unintended inflation of the air bag system, be sure the battery is disconnected and the ignition switch has been in the “LOCK” position for at least 90 seconds before performing any electrical service work on your MARUTI SUZUKI. Do not touch air bag system components or wires. The wires are wrapped with yellow tape or yellow tubing, and the couplers are yellow for easy identification. Scrapping a vehicle that has an uninflated air bag can be hazardous. Ask your dealer, body repair shop or scrap yard for help with disposal. According to accident statistics, children are safer when properly restrained on rear seats than front passenger’s seat whenever possible, MARUTI SUZUKI recommends that child restraint systems be installed the rear seat. 1) The light comes on briefly when the ignition switch is turned to the “ON” and/or “START” position. 2) The light comes on when the parking brake is engaged with the ignition switch in the “ON” position. 3) The light comes on when under either or both of above two conditions. The light also comes on when the fluid in the brake fluid reservoir falls below the specified level. The light should go out after starting the engine and fully releasing the parking brake, if the fluid level in the brake fluid reservoir is adequate. The light also comes on together with the ABS warning light when the rear brake force control function (proportioning valve function) of the ABS system fails. 1) Pull off the road and stop carefully. Remember that stopping distance may be longer, you may have to push harder on the pedal, and the pedal may go down farther than normal. 2) Test the brakes by carefully starting and stopping on the shoulder of the road. If any of the following conditions occur, you should immediately ask your MARUTI SUZUKI dealer to inspect the brake system. - If the brake system warning light does not go out after the engine has been started and the parking brake has been fully released. - If the brake system warning light does not come on when the igni- tion switch is turned to the “ON” position. - If the brake system warning light comes on at any time during vehi- cle operation. reservoir is considered normal periodic maintenance. When the ignition switch is turned to the “ON” position, the light comes on briefly so you can check that the light is working. If the light stays on, or comes on when driving, there may be something wrong with the ABS. 1)Pull off the road and stop carefully. 2) Turn the ignition switch to “LOCK” and then start the engine again. If the warning light comes on briefly then turns off, the system is normal. If the warning light still stays on, there is something wrong in the system. 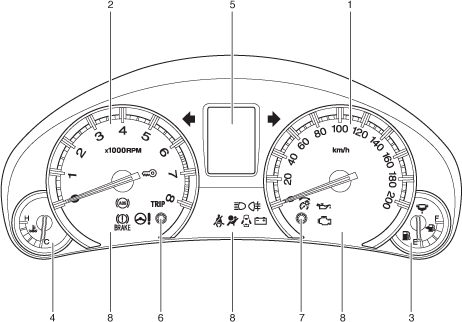 If the light and the brake system warning light stay on, or come on simultaneously when driving, your ABS system is equipped with the rear brake force control function (proportioning valve function) and there may be something wrong with both the rear brake force control function and anti-lock function of the ABS system. If one of these happens, have the system inspected by your MARUTI SUZUKI dealer. If the ABS becomes inoperative, the brake system will function as an ordinary brake system that does not have this ABS system. This light comes on when the ignition switch is turned to the “ON” position, and goes out when the engine is started. The light will come on and remain on if there is insufficient oil pressure. If the light comes on when driving, pull off the road as soon as you can and stop the engine. Check the oil level and add oil if necessary. If there is enough oil, the lubrication system should be inspected by your MARUTI SUZUKI dealer before you drive the vehicle again. - If you operate the engine with this light on, severe engine damage can result. - Do not rely on the oil pressure light to indicate the need to add oil. Be sure to periodically check the engine oil level. This light comes on when the ignition switch is turned to the “ON” position, and goes out when the engine is started. The light will come on and remain on if there is something wrong with the battery charging system. If the light comes on when the engine is running, the charging system should be inspected immediately by your MARUTI SUZUKI dealer. This light blinks or comes on for several seconds when the ignition switch is turned to the “ON” position so you can check if the light is working. The light will come on and stay on if there is a problem in the air bag system or the seat belt pretensioner system. If the “AIR BAG” light does not blink or come on briefly when the ignition switch is turned to the “ON” position, stays on for more than 10 seconds, or comes on while driving, the air bag system or the seat belt pretensioner system may not work properly. 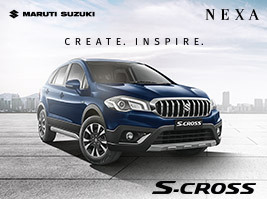 Have both systems inspected by an authorized MARUTI SUZUKI dealer. Your vehicle has a computer-controlled emission control system. A malfunction indicator light is provided on the instrument panel to indicate when it is necessary to have the emission control system serviced. The malfunction indicator light comes on when the ignition switch is turned to the “ON” position to let you know the light is working and goes out when the engine is started. If the malfunction indicator light comes on or blinks when the engine is running, there is a damage in the emission control system. Bring the vehicle to your MARUTI SUZUKI dealer to have the problem corrected. Continuing to drive the vehicle when the malfunction indicator light is on or blinking can cause permanent damage to the vehicle’s emission control system, and can affect fuel economy and driveability. This light blinks as a reminder until the driver’s seat belt is buckled. When the ignition switch is turn to the “ON” position, this light comes on briefly so you can check that the light is working. If this light blinks with the ignition switch is turn to the “ON”, the engine will not start. If this light blinks, turn the ignition switch to the “LOCK” position, then turn it back to the “ON” position. If the light still blinks with the ignition switch turned to the “ON” position, there may be something wrong with your key or with the immobilizer system. Ask your MARUTI SUZUKI dealer to inspect the system. This light remains on until all doors (including the tailgate for some model) are completely closed. If any door (including the tailgate for some model) is open when the vehicle is moving, a ding sounds to remind you to close all doors completely. If this light comes on, fill the fuel tank immediately. When this light comes on, a ding sounds once to remind you to fill the fuel. If you do not fill the fuel, a ding sounds every time when the ignition switch is turned to the “ON” position. The activation point of this light varies depending on road conditions (for example, slope or curve) and driving conditions because of fuel moving in the tank. This light comes on when the ignition switch is turned to the “ON” position, and goes out when the engine is started. If this light comes on while driving, the power steering system may not work properly. Have the system inspected by your MARUTI SUZUKI dealer. If the power steering system does not work properly, you will feel heavier to steer but you still will be able to steer. The rear fog light indicator light comes on when the rear fog light operates. When you turn on the left or right turn signals, the corresponding green arrow on the instrument panel will blink along with the respective turn signal lights. When you turn on the hazard warning switch, both arrows will blink along with all of the turn signal lights. This indicator comes on when headlight main beams (high beams) are turned on. This light comes on for several seconds when the ignition switch is turned to the “ON” position so you can check the light is working. If the light comes on, keeps on glowing, get the water drained from the fuel filter. If the coolant temperature is cool enough, this light comes on when the ignition switch is turned to the “ON” position and goes out when the glow plug is heated enough for engine starting. 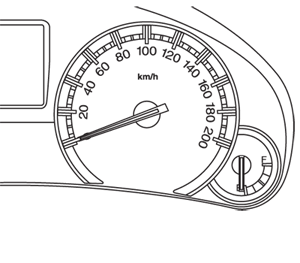 The speedometer indicates vehicle speed in km/h.